i finished with my home made turbo set up for my buggy and it start fire right away but , some how i have oil coming out from exhaust and makes white smoke when i press pedal. maybe wrong oil feed line? switch other side or? and here the video how it work you will see oil coming out and white smoke. Last edited by AJRMK; 07-17-2011 at 06:24 PM. oil feed is the smaller hole and the oil return is the bigger hole. if you look into the oil feed side of the turbo you should see a small restrictor built in. 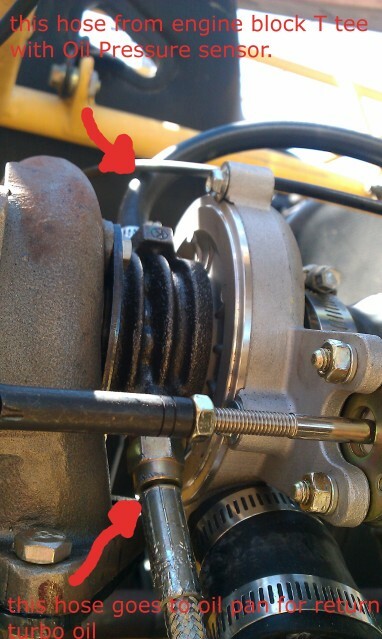 if you reverse these the oil will escape through seals as the oil drain side is not designed to see oil pressure. also. your oil feed line should not be that big. -3 or -4 line at the most. i already switch to side and still have white smoke but oil stop leaking.. i also have oil restrictor and still do the white smoke and when i remove the exhaust to see if oil coming out from exhaust and it does very slow. already did and still do the same? have any idea? how will i know if turbo bad ? the damage may have been done already. pull the turbo apart and replace the seals. is this a garrett gt15 turbo or a knockoff? Are you running antifreeze? If the white smoke smells sweet (like antifreeze) it could be a Head Gasket. 95 cx mini me really high idle white smoke no coolant in oil PLEASE HELP PLEASE! Smoke, smoke, oil?, smoke! Please HELP! ?